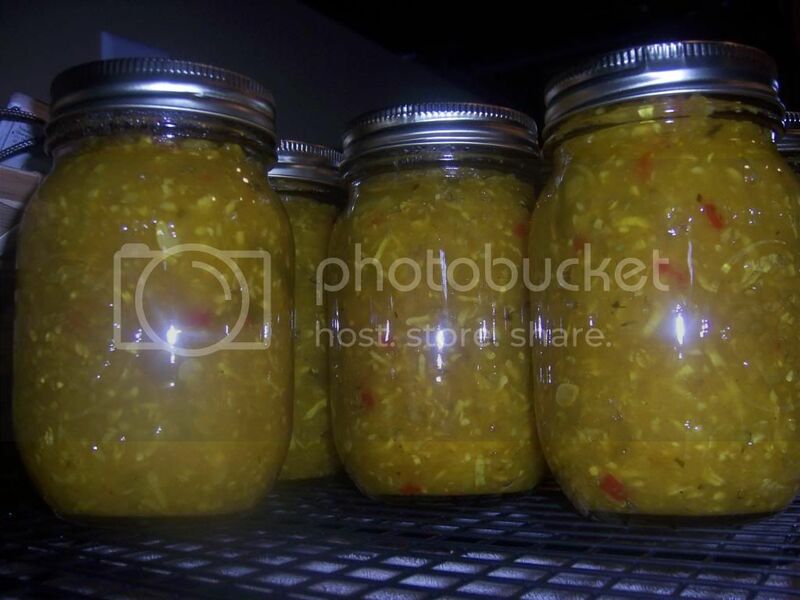 Squash Relish.....This stuff is AWESOME!!! WAY too good not to share. 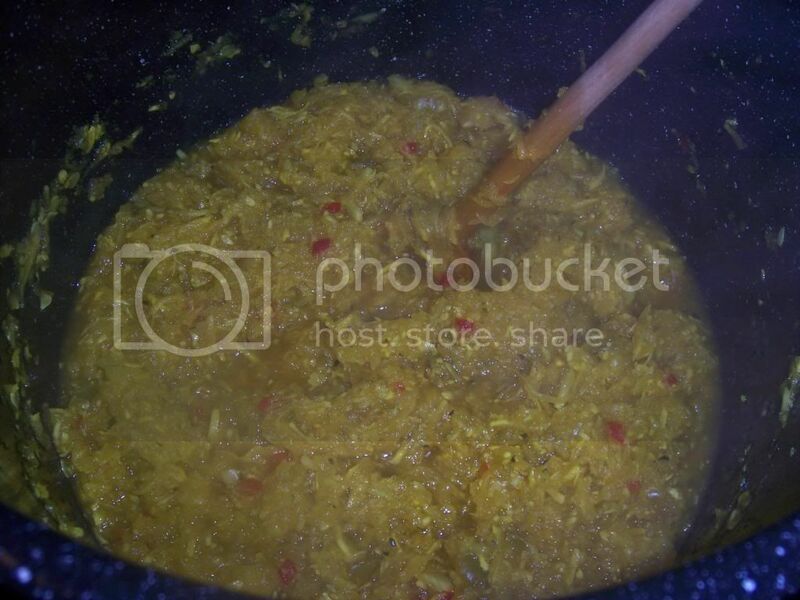 Mix yellow squash,zucchini and onions together with 2 tablespoons of canning salt and let sit overnite.Drain liquid off squash/onion mixture. In a large,thick bottomed stock pot that is coated,enameled etc.Do not use bare metal pots,the vinegar will react and turn cloudy. Heat mixture to a simmer,add veggies,return to a simmer and cook for 30 minutes,stirring often. Fill sterilized canning jars to within 1/2 inch of top,place heated lids on jars,place rings on jars and tighten.Place filled jars in a waterbath of boiling water covered by at least 1 inch.Process pints for 10 minutes(Quarts 15 minutes),remove,let cool on racks.ENJOY!!! I will have to find something to replace the bell pepper, or just leave it out, but your recipe goes right into my cook book. Thanks! The overnight dry brine is a really good move. You can substitute any pepper you like or omit it.I think you will still like it. Great looking relish. Mangoes are going to be ready in 2-4 weeks. Wanna Trade? Sure! I tried the Kona coffee rub on a pork tenderloin.It was FABULOUS!!! I knew it was only a matter of time before you would start posting pics from the stuff out of your garden....this stuff looks yummy! Did you shred in food processor - or use a grater? I often pick up a b-load of squash and make mega casserole amounts to freeze. You are one cooking king! My pleasure.Some things are too good not to share. Food processor with the grating plate in place. Hoss, when are you opening up a store? It is a joy to see all the things you do with everything you grow! thanks, I am not much of a canner, but my cousin is and she has plenty of squash coming in. I will pass this recipe to her in exchange for half the jars canned :laugh: I can't wait to taste this. Oliver's Law of Public Speaking- A closed mouth gathers no feet.